With the creation and guidance of planning agencies like The Research and Urban Planning Institute of Curitiba (IPPUC), a mass transportation system developed that today covers eight neighboring cities, and transports 1.9 million passengers daily with an 89% approval rate. Due to agricultural mechanization from the 1950s to the 1980s, cities across Brazil experienced rapid growth with the migration of people from rural areas to urban areas. Curitiba, the capital city of the State of Paraná, experienced some of the highest growth in the country with population increases reaching an estimated 5.7% a year during those decades. This uncontrolled increase in population presented circumstances that demanded effective city planning in areas ranging from social services, housing and sanitation, to the environment and transportation. From the 1940s to the 1960s urban planners in Curitiba began the process of creating an urban Master Plan. Part of that plan included constructing a consolidated public transportation system to move people easily throughout the metropolitan area and its surrounding municipalities. 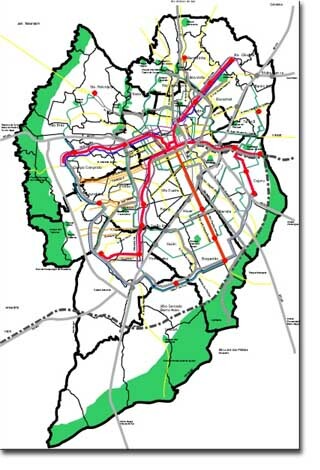 With the approval of Curitiba’s Master Plan in 1966, guidelines were established that restructured the city’s radial configuration into a linear model of urban expansion. Accordingly, urban planners realized that transportation land use and road systems can be used as integrative tools of development in compliance with these guidelines. In the 1970s, zoning laws were set in place and Structural Avenues were designed to direct linear growth by attracting residential and commercial density along a mass transportation lane. In 1974, the main mass transit line began to operate along those avenues. With the creation and guidance of planning agencies like The Research and Urban Planning Institute of Curitiba (IPPUC), a mass transportation system developed that today covers eight neighboring cities, and transports 1.9 million passengers daily with an 89% approval rate, according to a survey done by URBS. To accommodate the growing population over the past 30 years, the system has grown to utilize varying types of bus services that cater to the needs of passengers within the metropolitan areas and surrounding municipalities. The Integrated Transport Network, now operating with 1,902 busses, is designed to allow the passenger to make travel accommodations to a certain destination without paying more than one passage within the metropolitan area. This integrated system connected by tube stations and terminals also incorporates an express bus system that serves as a surface subway for the city of Curitiba whose foresight in urban planning has demonstrated positive results. The development of Curitiba’s world-renowned transportation system began in the late 1960s, early 1970s. Unlike other Latin American cities at the time, Curitiba’s planners decided to address the process of transportation as an integrative approach that can assist in the development of the city. In Curitiba’s case, its planners recognized that transportation systems can serve as the backbone for the development and growth of the city in the future. Instead of succumbing to the demand of the population and addressing transportation as a service that caters to an ever prevalent and pressing demand, they essentially planned their system with the intention of dictating the growth of the city. Curitiba decided to use busses as its primary means of public transport because it was not only the choice of transport in the past, it was also the most cost effective means of transport. To understand the integration of this famous system of transportation and the system itself, one would have to understand the history of Curitiba and recognize its foresight in urban planning that stems from a tradition of innovative planners. Endless pine forest that once covered the municipality of Curitiba, and much of the Iguacu River region of southern Brazil, inspired the long vanished indigenous Indians to name the area accordingly. With the arrival of European settlers in the 1600s, a small settlement developed inside the luscious pine forest that was named Curitiba, signifying many pine seeds. The settlement grew with the advance of the cattle trade as cattle-drivers from the southern states used the strategic location of the town as a post on their way to São Paulo. The increase in cattle transportation characterized the settlement as a trading post which in turn attracted businesses and shops to the area. As a result, this small agrarian town grew in prosperity and progressively found itself as the capital of the newly emancipated State of Paraná in 1842. In the late 1800s and early 1900s, Curitiba developed into the capital city of Paraná with the construction of schools, theaters and clubs. Streets began to be constructed as the population increased and there evolved a growing need for a public transportation system. On November 8, 1887, Curitiba introduced its first public transportation system. The system included open horse drawn carriages that were used until the introduction of the electric trolleys in 1913. During that time, Curitiba continued to grow. From 1903 to 1913 the number of passengers that used the system increased from 680,000 to 1,910,000. Again there was a dire need to improve the transportation system to satisfy the growth in passengers. The city continued to grow and more public service programs were developed. Within the first decade of the 20th century, streets were paved and widened. In particular, it was the administration of Mayor Moreira Garcez (1920-1928) who commissioned the paving of roads and the development of structures throughout Curitiba. It wasn’t until 1928 that a company called Companhia Força e Luz began to explore the possibility of using busses as a means of transport and creating regular bus lines. Unfortunately, at the time the outlandish cost of riding the bus rendered this mode of transport publicly unfavorable compared to the electric trolleys that still were in use. In 1938, 10,975,699 people used the trolley system in comparison to 2,678,638 who rode the busses. Even with the addition of bus lines in 1942 the majority of the population preferred using the trolleys because they were cheaper. For the duration of the 1940s there arose a fierce competition between trolleys and busses. It was also during this time that the city started looking into various types of efficient mass transportation systems. Slowly, bus routes began to replace trolley routes. Then, in 1951 the trolley system stopped transporting passengers completely. Following a public revolt against the highly priced busses, the city government regulated bus fares putting the cost of all rides to 50 cents/cruzeros, the first unified fare in Curitiba. Towards the end of the 1940s into the mid 1950s there began a noteworthy transformation in Curitiba with the implementation of the Preliminary Urban Plan. At this time, Architect and City Planner Alfredo Agache, the co-founder of the French Society of Urban Studies, wanted to introduce a new standard of urban space design. Agache, who was commissioned to create an urban plan for Curitiba, designed a development scheme that gave priority to public services such as sanitation, easing traffic congestion and creating centers that enabled the growth of both social life and commerce. After two years of preparation, economic setbacks curtailed the full implementation of the plan. However, initial parts of his plan that include large avenues, an obligatory setback of five meters from the curb as a buffer zone for new buildings, an industrial district, the civic center and the municipal market remain. While the Agache Plan was not constructed completely, from its inception it is evident that city planners in Curitiba were willing to develop the city in accordance with his vision. In the 1960s, Mayor Ivo Aruza Prereira commissioned Curitiba Research and Urban Planning Institute to create an urban plan for the city. The Master Plan established guidelines that changed the city’s radial configuration of growth to a linear model of urban expansion. The plan utilized land use and road systems as integrated tools to implement that principle. With the approval of the plan in 1966, the first step was taken with the creation of the Institute for Research and Urban Planning in Curitiba (IPPUC). The institute introduced zoning laws and design for the city in compliance with the urban plan. In 1969, Mayor Omar Sabbag developed the preliminary mass transportation plan and, in 1971, the mass transit terminal plan was developed under Architect Jamie Lerner’s first appointed mayoral term. 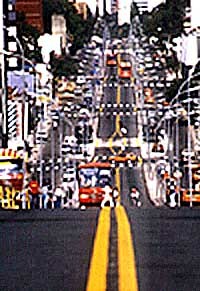 Lerner’s administration commenced in 1971 by creating Brazil’s first pedestrian network in the center of the city. But, the most significant changes in the transportation system were taken in 1974 with the creation of the road hierarchy and land control system (Rabinovitch and Hoehn, 1995). In coordination with the Master Plan they began to construct the first two out of five arterial structural roads that would eventually form the structural growth corridors and dictate the growth pattern in the city. These structural corridors were composed of a triple road system with the central road having two restricted lanes dedicated to express busses. Parallel to the express bus lanes were two local roads running in opposite directions. They allowed local traffic to pass through the city. In 1982, all five structural corridors were completed with inter-district and feeder lines. In accordance with these structural roads, zoning laws were set in place to structure the growth of the city. Large buildings holding a high density of people were permitted to be built along these corridors, but, as one moved away from these central corridors, the admissible densities declined from urban apartment buildings to residential neighborhoods (Rabinovitch and Hoehn, 1995). With the evolution of the transportation system there increased a need for an effective mode of payment. Curitiba’s city hall wanted to expedite bus service and recognized that one of the factors that generated delays is the hold-up in the mode of passenger payment. Over the years there have been many forms of payment implemented. A new system to avoid delays was created in which the city eliminated transfer payments and substituted them with transfer tokens made of paper. But after 7 months of implementation, the city discovered major forgery of the paper transfers. The city then tried to install a two-fare payment, separating the express fares from the feeder fares (fares for the outlying buses connecting to those going to the city center). This system was repealed after one and a half-years because it favored the rich who resided closer to the center and paid only one fare over the poorer population who resided on the periphery of the city and would have to pay two passages to arrive in the center. In 1980, the city finally developed and constructed transfer terminals that operated like subway stations. The terminals, constructed with telephone accessibility, attracted newsstands and flower shops and became aesthetically attractive and user friendly. It was also at this time that the city introduced automatic ticketing to the system. This form of payment allowed passengers to purchase metal tokens at terminals, newsstands or shops, or pay with money at the bus terminals. They hoped to increase the speed of transfers and boarding of passengers which would expedite bus circulation. The city believed that under careful planning of transfers, passengers could travel throughout the system for only one fare. Despite the fare issues, the city had to deal with the overwhelming attraction of the express system. Upon its implementation in 1974, its novelty and popularity resulted in overcrowded busses that caused delays in boarding at stops and terminals. To compensate for the loss in time, bus drivers would increase speed, creating potentially dangerous situations and accidents. The city found it necessary to implement speed control monitors, create boarding tubes and tailor bus designs to accommodate the growing demand. The city also had to create a system in which individual bus companies that catered to the various zones in the city could share revenues without competing with each other. Traditionally the city was partitioned in different zones that were serviced by individual bus companies. But, with the creation of the inter-district routes and the implementation of the Integrated Transportation Network along with the unified fare, passengers could pay one company at a terminal located in a particular zone and ride the system without paying the other bus companies. In 1987 the city addressed this problem by distributing transportation revenue based on the number of kilometers traveled by vehicle type for any given company. With each company given a number of route kilometers and a timetable, each company competes with the schedule not with other companies (Rabinovitch and Hoehn, 1995). After the construction of terminals and the implementation of the unified fare, the city wanted to develop busses and stations designed with the intention of avoiding fare evaders. For this reason, busses are designed with three doors, two doors for exiting and a front door for boarding. In a category by itself, these urban busses are constructed with turbo engines, lower floor levels, wider doors, and a convenient design for mass transit. Curitiba also developed boarding tube stations that were placed along direct routes and express lanes. To increase convenience, boarding efficiency and reduce fare evaders the tubes elevate passengers to the bus platform level where automatic doors operated by the tube conductor open parallel to the bus doors. Passengers pay an entrance fare at the turnstile and wait for their respective direct or express bus to pass. Disembarking passengers leave the stations through a direct exit. To further assist passengers, each tube station is equipped with station and route maps and with small lifts situated beside the entrance of the tube to help disabled passengers, strollers, and passengers carrying heavy bags enter the tubes with agility. The transportation system is made up of three complementary levels of service that include the feeder lines, express lines and inter-district routes. The feeder lines pass through outlying neighborhoods and make the system easily accessible to lower density areas. Sharing the roads with other vehicles, these feeder lines connect with the express system along the structural corridors. The express system then utilizes these dedicated bus lanes and transports large numbers of passengers to various locations along these structural corridors, thus operating much like a surface subway system. The inter-district routes allow passengers to connect to the axis of the express lines without entering the central city area. The Integrated Transportation Network (ITN) encompasses transfer terminals, express routes, direct routes using boarding tubes, feeder and inter-district routes supplemented by center city routes, neighborhood routes, night routes, special education routes, and pro-park routes which collectively make up Curitiba’s Mass Transit System (MTS). Through carefully planned tube or terminal connections, passengers can pay one fare and travel throughout the system. To facilitate use of the system, passengers can identify a specific route by the color and type of the bus used. The thirteen express lines that make up the express bus system for instance, operate on the structural corridors and are represented by large red articulated, bi-articulated or silver “padron” busses. Articulated and bi-articulated busses are large busses capable of carrying 170-270 passengers respectively and are joined in the center by a pivot joint and flexible tubing that allows the bus to curve around turns without occupying more than one lane of traffic. Articulated busses have one joint and bi-articulated have at least two connected units. They are virtually like a train with connected cars. These busses connect the transfer terminals to the city center. Passengers pay, enter and exit at tube stations. The feeder routes are characterized by orange conventional busses that connect the terminals with the surrounding neighborhoods. Inter-district routes use green padron or articulated busses that connect transfer Terminals to different districts without passing through the center of the city. The direct speedy routes are silver and use the tube stations along routes that link the main district and surrounding municipalities with Curitiba. Then there are Conventional Integration Radial Routes that are marked by yellow padron busses. They operate on the normal road network between the surrounding municipalities, the integration terminals, and the city center. The City Circle Line is a fleet of white mini-busses that circle the major transport terminals and different points of interest in the downtown area. All school busses are marked with a yellow stripe and busses dedicated for the disabled are blue. The Integrated Transport System is made up of 340 routes that utilize 1,902 busses to transport 1.9 million passengers per day. The entire network covers 1,100km of roads with 60km of it dedicated for bus use. There are 25 transfer terminals within the system and 221 tube stations that all allow for pre-paid boarding. The Integrated System also has 28 routes and special busses dedicated to transporting special education and disabled patrons. Curitiba’s system of transportation is an example of effective urban planning. The city’s urban planners recognized that even if growth in population cannot be controlled, the development of infrastructure in the city can guide the city’s expansion. By approaching transportation as tool used to attain a greater solution rather than as a solution to an advancing problem, they were able to implement an efficiently constructed, cost-effective transportation system that finances itself. The city used busses because it had a tradition of using busses. While this system is powered by diesel, the reduction of the number of cars used compensates, if not surpasses, the difference in carbon monoxide emissions. Like every city, Curitiba’s transportation system is plagued by overcrowded peak hours and untimely busses. But, this is a relatively minor inconvenience in comparison to the service provided and the proximity served. From personal experience I can testify to the agility of this system. In comparison with transportation systems in Rio de Janiero, where passengers have to flag down and run after a number of private busses that provide service to the same destination using different routes and New York City were busses are often caught in unrelenting city congestion for a good part of the working day, Curitiba's integrative bus system with its express lanes and bus expediency, essentially works. “Curitiba Integrated Network, Urban Transportation World Reference.” URBS, Curitiba. “Curitiba Urban Management, Building Full Citizenship.” World Habitat Awards, Building and Housing Foundation, 1996. Rabinovitch, J and Hoehn, J. “A Sustainable Urban Transportation System: the “Surface Metro” in Curitiba, Brazil.” The Environmental and Natural Resources Policy and Training Project, Michigan State University, 1995. Rabinovitch, J and Leitman, J. “Urban Planning in Curitiba, A Brazilian City Challenges Conventional Wisdom and Relies on Low Technology to Improve the Quality of Urban Life.” Scientific American, 1996. Zaruch, L.J. “Roteiro da Cidade, do bonde de mula ao onibus expresso.” Digital fotogravura Ltda., Curitiba, Paraná. 1975. Because Curitiba’s transport system is comparable to a surface subway system transported by busses, it can be altered to fit the needs of the growing population. The entire MTS is currently operated by Urbanização de Curitiba (URBS), a publicly-administrated, privately-funded company that was founded in 1963. Together with IPPUC both agencies are responsible for land use development, maintenance and extension of the mass transportation system. There has been no known documentation of Curitiba’s system. The integrated system itself has been used as a point of reference for cities around the world who are looking to implement an efficient transport network.